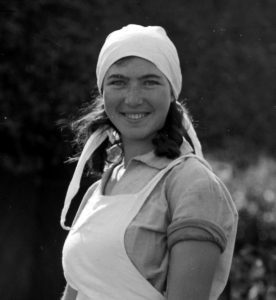 Photo: Davora Rushkin, Zionist immigrant of Russian-Polish background in a girls kibbutz at Borochov, Palestine in the1920s. Library of Congress. Belarusians or Byelorussians, sometimes called White Russians, are part of the Eastern Slavic peoples of Poland, Lithuania and Russia. Many are ethnically and religiously Jewish. The Belarusian people trace their distinct culture to the Grand Duchy of Lithuania and earlier Kievan Rus and the Principality of Polatsk. Most Belarusians are descendants of the East Slav tribes Dregovichs, Krivichs and Radimichs, as well as of a Baltic tribe of Jotvingians who lived in the west and north-west of today’s Belarus. 1) The Belarusian population represents 176 unrelated individuals from Belarus, residing in localities evenly distributed through the country who were sampled in 2006 by the Medical university of Gdansk in Poland and the National Academy of Science in Minsk, Belarus. 2) The Belarusian – Northern Poland population represents 212 unrelated healthy volunteers of the Byelorussian minority of residents in northeastern Poland where they account for a significant percentage of the local population. The study was conducted by the Central Forensic Laboratory of Polic, Warsaw, and Medical University of Bialystok in 2003.
minority residing in the northeastern Poland, FSI, 2004, p265-267. Belarusian population genetic database for 15 autosomal STR loci, FSI, 2007, p235-237.